hd00:20Close up of a lit Jack-O-Lantern with toothpicks for a grill of teeth. Focus starts on the outside and zooms to the inside candle to reveal mold growing inside the pumpkin to make it extra scary. 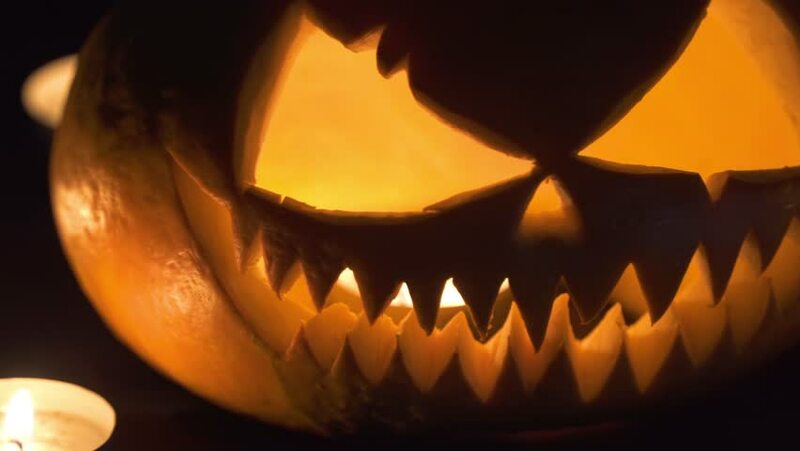 hd00:15Creepy close up video of a lit Jack-O-Lantern with toothpicks for teeth. In the middle of the video, the pumpkin shakes a bit as if it is coming to life. Reminiscent of the headless horseman. hd00:09All Saints' Day,Halloween.Pumpkin with a carved angry face and teeth in the shape of a saw, inside the pumpkin candles are burning. A gourd pumpkin. Quiet and calm. 4k00:10Abstract fabric with a fiery pumpkin is in motion. Background for Halloween party entertainment.